In the skin, extracellular matrix is composed from hyaluronic acid and other sulphated agents combined with collagen and elastin. As skin ages, the supportive components of the skin are gradually destroyed. The skin becomes drier and thinner and starts to sag. In addition, wrinkles appear facial muscles stiffen with age. Thus, areas subjected to repeated movements facial expression, such as the forehead and around the eyes and lips, become wrinkled. There are three types of facial wrinkles: dynamic wrinkles, static wrinkles, and wrinkle folds. Dynamic wrinkles are caused by the contraction of muscles that are attached to the overlying skin. Each muscle contraction causes the skin to tighten, thus forming lines. The most common locations for dynamic wrinkles are frown lines between the eyebrows, horizontal lines across the forehead, and lines extending from the outer corners of the eyes. Static wrinkles are due to the lack of elasticity of the skin caused by sun damage, smoking, genetics, poor nutrition, or from prolonged dynamic wrinkling. Static facial wrinkles are visible regardless of muscle contraction; they stay even when the muscles are not contracting. Wrinkle folds are often due to sagging of the underlying facial structures, most notably causing deep grooves between the nose and mouth known as the nasolabial folds or smile lines. 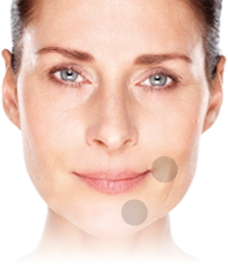 A loss of volume in fatty tissue between the mouth and the cheeks create lines or ridges. are long vertical lines that laterally circumscribe the chin (oral commissures). These lines give you a sad and tired expression. are diagonal lines between lips and chin. are lines or wrinkles that run from the corner of the nose downward the corner of the mouth (smile lines). are fine lines which form on the upper lip (smoker lines or vertical lip lines). radiate outward the corners of the eyes (crow’s feet). (worry lines) come in two types: vertical and horizontal. 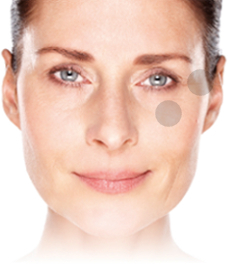 The vertical wrinkles usually occur between the eyebrows, just above the nose. 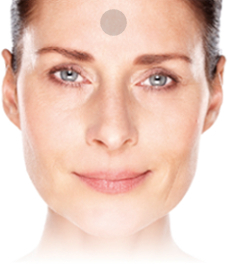 Horizontal wrinkles occur between the top of the eyebrows and the hairline. are vertical lines that form between the eyebrows over time (frown lines). They make a person look angry. are horizontal wrinkles which form across the ridge of the nose. That can be an ironic side effect of Botox.